There were a few parts of her job as platoon master sergeant that Shayma Hamdi did not like. This was one of them. However, she had no choice as discipline had to be maintained. And though other staff NCOs might have reported the incident to the CO and left, MSgt Hamdi couldn’t. They were her people and she would stand with them. From the looks on privates first class Rice and Newman’s faces, they weren’t sure what was going to happen. Truth was, MSgt Hamdi didn’t know either. She was having trouble with that lately, not being sure what to do. She’d been a Hospitaller for two contracts, twelve standardized years. Upping for another six years was supposed to be a no-brainer. So simple a 2nd Radial Marine could figure it out, as the joke went. But she, the PFCs sitting across from her, and Major Burge in his office, were Hospitallers. While that was much like a Marine, it was also nothing like a Marine. Most Marines had family, for instance. Every Hospitaller was, is, and would always be an orphan, raised in the Hospitaller-run orphanages. It meant that for as long as she could remember, Hamdi had been a Hospitaller. She’d chosen the field aid and combat arm of the organization. She’d been involved in tens of operations, delivering aid, comfort, and providing defense when needed. Things she’d played at in elementary school, practiced in high school, and trained for in her first years as a Hospitaller. Like Rice and Newman, she’d been a Pfc at one time. Hamdi smiled and shook her head. They knew what they wanted. Maybe a little too much. The handle on the hatch to Hamdi’s right clicked and scraped. She looked over as the hatch swung inward. Corporal Sutton stepped into the open, one foot on either side of the hatchway. “MSgt Hamdi,” said the corporal. Rice and Newman stood. They gave each other a quick glance and then did a proper left face before marching over the hatchway and into the next room. They had to cross the small office that was Cpl Sutton’s to reach the major’s office. Hamdi often thought of it as stepping into the jaws of the jaws. “You coming, too?” asked Cpl Sutton. “Don’t I always?” MSgt Hamdi stepped into the smaller office just as the two PFCs stepped into Maj Burge’s office. “Yes, you always,” said Cpl Sutton. “Right. Thanks.” Hamdi hurried into the major’s office. They were three levels below the loading deck of the drop-ship carrier Arnaud, back just past midway from the fore. She had to focus to feel the thrum of the engines she’d grown accustomed to. If she had the time. “Took you long enough, Hamdi,” the major said. While the three Hospitallers snapped to the at-ease position, Maj Burge glanced at a tablet, using his ring finger to slide the digital page upward. Hamdi doubted he was reading the report she’d submitted. Likely he’d read it several times and was now only refreshing himself on the salient points. He’d spoken so softly that MSgt Hamdi had to pull herself back to straight position. She’d been unconsciously leaning in, trying to hear Pfc Rice. Hamdi took the opportunity to look over at her people. Rice had looked to Newman. Newman’s face showed the flicker of a smile. Hamdi could see the side of Rice’s face and his cheek bunched, a soft smile likely forming on his face. Maj Burge flicked two fingers across the tablet screen. “Yes, Major,” both men said in unison. Hamdi and the two Pfcs snapped to attention, saluted and did a hard right face. Surprised, Hamdi stepped aside and watched as the other two marched through the hatch, and then ran for the corridor beyond the outer office. She caught a glimpse of Cpl Sutton who only shrugged her own ignorance to the current situation. With no clue as to what the major wanted, Hamdi returned to her at-ease position, facing the desk. It took Hamdi a moment to catch up. She’d been focused on Rice and Newman. They were both excellent at working with locals in a crisis. They were both dependable in a firefight. Maj Burge knew that, too. The point of his question caught up to her quickly enough, though. Hamdi knew better than to argue. She pulled a chair to the center of the room and sat, hands on knees. Most of the Hospitallers from her year at the orphanage were still sergeants and staff sergeants. Rarely did people move out of the Hospitaller military service. There was only up, and she was told that the best Hospitallers were tapped for promotions, some even tapped for officer candidate training. She’d turned down OCT. Never regretted it. That, Hamdi knew from being taught and from teaching, was because of the orphanage system. No one in the Hospitallers had been raised by their own family. Some, like Hamdi, had never known her biological family. Her earliest memories were of dorm parents and the twenty-nine other kids she shared the company dorm with. That was how the Hospitallers began, looking after the orphans left behind by the Radial War. The wealthiest seven people had put it together, funded it. Now, almost two and a quarter centuries later, Hospitallers ran orphanages, hospitals, research facilities, several colleges, factories, and one of the most highly trained military forces in the arm. Some would say the best, but Hospitallers were more concerned about providing aid and comfort. Military action was always the last option. “Sort of, Major.” She smiled, feeling awkward. Maj Burge sat up. He pulled the tablet closer and began swiping through the documents. Ten years, Hamdi had known the major. He’d been a lieutenant at their first meeting, and she still wondered at the use of his ring finger to operate the tablet. Everyone else seemed to naturally use their pointer finger. The middle finger if they’d lost the other. Never the ring finger. Hamdi’s hands were pinched between her knees. Why was this decision so difficult? Why could she not just say yes, and sign the contract? What was holding her back? There was a heavy pause where Maj Burge permitted a smile to lighten his previously stern look. “You’ve heard of them, then, Hamdi? Hamdi had heard. Over the twelve years of enlistment, she had heard exactly two people talk about them. One of them had been a nurse in a hospital who’d wanted to stay long enough to see a patient make it back to their unit. The other had ridiculed the whole idea, but then, he’d also been demoted from staff sergeant to private first class. And extension would have given him time to reach corporal before his next contract, but he’d been too bitter over the demotion to think logically. So when she began to wonder what to do with herself, now that her contract was coming to an end, Hamdi had done some research. She knew quite a lot, now, about Hospitaller contracts and extensions. “Vaughn’s got a point, Sarge.” Several of the enlisted had gathered around the triad of Cpl Vaughn, Cpl Young, and Sgt Walters. The platoon was on the loading deck of the Arnaud. The deck ran the length of the ship and was the middle deck, like a slice of protein between to fat slices of bread. Loading ramps jutted out from a string of openings down both sides of the ship. They reminded Hamdi of hungry mouths, eager to be fed. Everywhere there was ordered chaos. On both sides of the deck, platoons were loading crawlers with gear. Some were carrying equipment by hand, others used hand trucks. Two platoons forward and starboard of midship were already guiding crawlers into the drop-ship bays. Elsewhere, like here where Sextus platoon, Acre company was gathered in a friendly argument, standard issue plastic crates were still stacked, making it easy for Hamdi to reach the platoon unintentionally unseen. Everyone but Sgt Walters jumped at the unexpected voice. Hamdi, standing between two stacks of crates, smiled at the wide-eyed group. Cpl Vaughn crossed his arms and grinned in Walter’s direction. Several other Hospitallers thumped Vaughn on the upper back in a congratulatory manner. Sgt Walters appeared unaware of the actions around him. He did seem confused in Hamdi’s opinion. But with good reason. Hamdi could see the eager look on the faces of the Hospitallers around her. It reminded her of the orphanage and Foundation day when they celebrated the creation of the Hospitallers. A big cake was served at dinner, with three flavors of shaved ice to choose from. Then, all the children in the dorm would gather around their dorm parents, eagerly anticipating the present they would each receive. There was a long silence. Hamdi imagined they were all trying to wrap their heads around the idea. Like the major had implied, there were very few that knew about contract extensions. But, as the implications of what Hamdi had said soaked in, faces bloomed with smiles. “That’s great,” said Cpl Young. General laughter followed her comment, as did several dozen handshakes and murmured, glad-you’ll-be-alongs. “You heard the master sergeant, people,” shouted Sgt Walters. Her voice would do any drill instructor proud, in Hamdi’s opinion. With a few quick laughs and a final handshake, Sextus platoon, Acre company turned to loading their drop-ships. They’d been assigned the Fuerte Olimpo and the Jose Fassardi for this mission. “Hospitallers at the back, can you hear me?” The cargo master’s voice boomed in the now cramped confines of the drop-ship named Fuerte Olimpo. Hamdi smiled at the interchange between her platoon and the cargomaster, SSgt Kimimela. Hamdi wondered nearly every time she sat in a drop-ship if eccentricity was a primary requirement for cargomasters. Not all bellowed like SSgt Kimimela. The cargomaster over on the Jose Fassardi was known for singing instructions in an operatic style. One of the first Hamdi had ever encountered after basic training was quiet spoken. She’d looked almost too small for her job. But, despite her diminutive stature and mousey voice, she had a cutting wit that left Hospitallers on board for the ride crying with laughter. There was a lot of laughter that SSgt Kimimela had to shout down. “There’s some of you who shouldn’t be laughing,” the cargomaster said. He was staring down at Cpl Redford. Redford blushed and held up his hands to stave off the accusatory glare. SSgt Kimimela started walking toward the front of the cargo bay. He paused as he reached MSgt Hamdi. She looked him in the eye. She’d never lost her lunch on a drop, so she wasn’t sure what he was going to try. Hamdi didn’t have a chance to respond. SSgt Kimimela was already moving, giving a couple of high-fives as he went. Up front, he turned and plopped into his seat. With one hand he started pulling on his straps, with the other he snatched a handset of the wall and pressed it against his ear, speaking quickly quickly into the other end. When he was done with the handset, he clicked the straps of his seat harness together, pulling to tighten them, and tucked away the loose ends. Once secured, he pulled a hand mic off the panel next to him. Just before SSgt Kimimela keyed the mic, Hamdi felt the rumble of the drop-ship engines coming online. As if waiting for the staff sergeant’s signature statement, the growl of the drop-ship’s engines intensified. Around her, Hamdi could see Hospitallers making last minute checks of shoulder straps, looking for any loose gear, and making jokes to take the edge off their nerves. Hamdi understood that last feeling. She’d been in only one close call on a drop-ship. That was in her first six-year contract. Drop-ships used a controlled freefall to enter primary and secondary world atmo. Tertiary and terraforming worlds, drop-ships used drogue chutes and heavy-duty parachutes to slow an engine-less freefall. Sometimes things went wrong. Entering a secondary world atmo, the drop-ship Cpl Hamdi had been in lost one of its four engines and went into a mad spiral. The centrifugal force had been intense, shoving every Hospitaller against their backrest. She’d been sure there’d be no walking away from the impact. However, the pilot had been exceptional, and despite the loss of the ship and the lower cargo hold, every hospitaller had survived, even if they had to exit on a stretcher. Maybe once every couple of years, a drop-ship failed. Considering the hundreds of drops made every month somewhere in the 2nd radial arm of the galaxy, the odds were against the worst happening. However, it could happen. That was enough to make every Hospitaller perversely entertain the idea that this drop was going to be the one. So, if they joked and laughed a little too sharply, it was understandable. Hamdi looked across the bay, through a space in the loaded supplies, at Sgt Young. He had a broad smile on his face. Before Hamdi could answer the hard clack of the drop-ship unlocking from the Arnaud shook the seats. Like the vast majority of drops, despite the vibrations that always seemed out of place, Hamdi had nothing to regret about her extension so far. The drop-ship touched down without issue. As he passed by, Hospitallers began to unbuckle their restraints. They stood and unlocked weapons from their brackets and gave them quick inspections. At the aft end of the bay, with the help of two privates, SSgt Kimimela, unsecured the cargo bay hatch. After that, Kimimela lifted a dark plastic cover and punched a large red button that someone had drawn a happy face on. The whine of the hydraulics and the creak of the hatch hinges signaled the hatch’s movement. Around Hamdi, Hospitallers were doing last minute checks on their gear and that of the Hospitaller in front of them. As this was not a combat situation, the Hospitallers at the hatch were more relaxed than in an active combat zone. There, the ballistic shields would have been unfolded to protect the people on point. The shields would drop when the passage was cleared. Here, on Panchala, four hospitallers knelt, weapons raised, safeties off, and nothing more. “Gate down,” SSgt Kimimela shouted. 3rd squad moved out from the protection of the cargo bay, weapons at the ready, fanning out to provide cover as necessary. Sgt Cornish, who’d kept close to the ramp was watching his people, his head swiveling left and then far right. 2nd squad exited the drop-ship, fanning out just ahead of 3rd squad. The process repeated until the entire platoon had taken up defensive positions that expanded to encompass the whole ship. When Hamdi and Lt Falcone exited the drop-ship, Hamdi could see the second drop-ship with the rest of the company fanned out around it. “Lovely vistas,” said Lt Falcone. Hamdi laughed as she looked around. They were just inside the boundaries of Kandas Raj, the regional capital. Like every major city on Panchala, Kandas Raj had been a focal point of the battles between local militias and the global government. Many of the buildings around their landing zone were battered, some nothing more than stubs jutting above the rubble. Indeed, the landing area had been cleared for the drop-ships prior to their arrival. The rubble had been pushed into low berms surrounding the ships. They were helpful in keeping the engine blast from washing through the nearest streets. The attention given to the landing areas had not been given to the adjacent streets where the broken bits of buildings had been moved just enough to provide essential passage. A hiss in Hamdi’s headset alerted her to a comm line opening. Lt Falcone looked at Hamdi and nodded. Hamdi tapped at the mic button near her throat. Hamdi closed the comm line and turned to Lt Falcone. Though he hadn’t talked, he had been on the line, too. “SSgt Kimimela?” he turned to address the cargomaster still in the hatchway. “Sgt Young? He scratched the paint on the last deployment, Lt Falcone.” Kimimela grinned after he spoke. Lt Falcone returned SSgt Kimimela’s salute and then headed to the berm. Hamdi followed. It was a low berm, easy to see over, but the rubble was unsteady. It took a couple extra seconds for them to make their way across. Near the other roughed-out landing pad, Maj Burge, Lt Castillo, and several others were waiting. As they approached, Hamdi recognized the first platoon master sergeant, Archie Aguilar. She gave him a nod, which he returned in kind. They’d both grown up in the same orphanage, but different halls and he’d been a year ahead of her. Hamdi saluted, too, waiting for both, Lt Castillo and Maj Burge to complete their salute before dropping hers. Her hand, though, went right back up as she realized a third officer was present. His rank was enough to bring Lt Falcone’s hand up again, too. 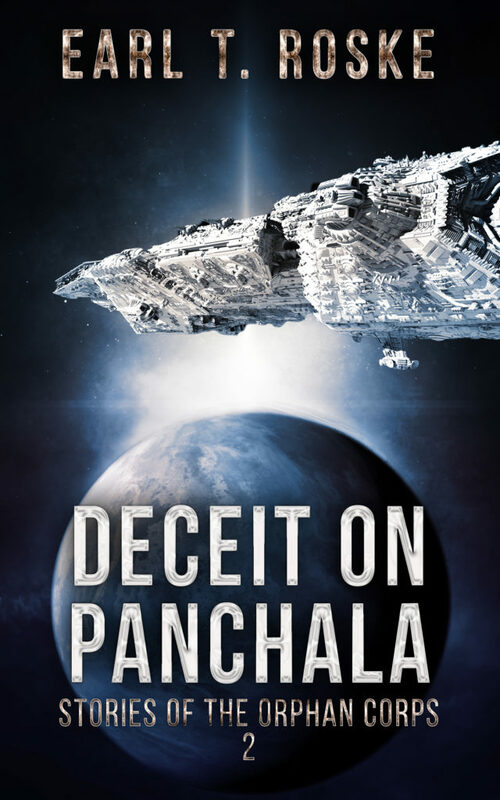 Deceit on Panchala, Stories of the Orphan Corps, is available on Amazon and Kindle Unlimited.